Sign me up! Do I need a subscription? No subscriptions needed. Just register on our website with your name and email address. We will contact you to arrange your order and delivery. Can I place a regular order? Once you know your needs, you can have a standard order. What if I need to make a change to my regular order? Just let us know by 9PM the night before your delivery day. We deliver throughout Westchester and Fairfield Counties (currently up to Norwalk) and the Bronx. There is a $15 minimum order for delivery. What about a delivery charge? We have a $6 per month delivery fee. How will my deliveries stay cold? 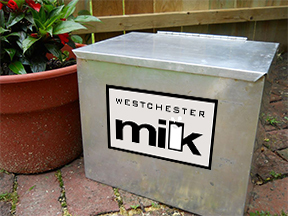 You can provide your own cooler or we can supply an insulated galvanized steel box for $30. We do! Once you have finished your milk, give your bottles a quick rinse and we’ll pick up your empties when we deliver your next order. If you have any questions or issues, please call us at 914-804-1380, and we’ll be more than happy to help you.